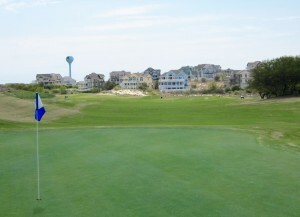 This year’s edition of the Conlon Brothers’ spring golf trip returned to Duck, NC for a series of rounds at the golf courses serving the Outer Banks. The roughly five-hour drive gave the Cape Region contingent of Kevin Conlon, Nick DelCampo, and yours truly a break from the usual travel commitment we faced when going to Myrtle Beach SC, Pinehurst NC, or other venues we have visited for this get-together. Our first round took place at the Kilmarlic Golf Club, a few miles west of the U.S. 158 causeway to Kitty Hawk, south of Duck (252-491-4220). This difficult par-72 course is a good example of the fact that yardage alone is no indication of how difficult it can be. We played the Gold tees at 6,001 yards, which carries a 68.8 course rating and a 134 Slope. It was more than enough challenge for our gang. This par-3 at Nags Head is often beset by high winds off the sound to the right. 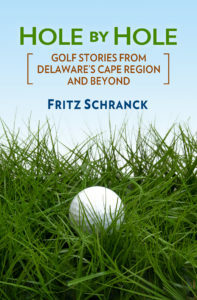 The second round was no easier, especially with the stiff breezes off Roanoke Sound. Five holes at the par-71 Nags Head Golf Links, including the 9th and 18th, lie hard by the Sound, and the whitecaps were constant in the 15-20 knot winds (252-441-8073). For the par 4s and par 5s, one handy tip I received for Nags Head is to go for the 150-yard markers, and avoid a lot of trouble on the narrow fairways. I should have taken that advice more often. The winds were far calmer when we played our third round at The Pointe Golf Club, in Powells Point (252-491-8388). A torrential evening downpour earlier in the week forced us to use lift, clean, and place, but the greens were in great shape and we enjoyed a beautiful spring day. We traveled to Grandy, NC the next day for a round at the par-72 Carolina Club, a sister course for The Pointe (252-453-3588). Showing the Pointe receipt earned us a nice discount on the Carolina greens fee. The greens were just as nice as The Pointe’s, and the extra day helped dry out the course a bit more. We were also able to fit in a nine-hole scramble after the regular round, for a very reasonable replay fee. The 12th hole at Currituck Golf Club carries the No. 1 handicap allocation for this challenging, windswept course. This photograph from behind the hole flattens perspective, and doesn’t show how much elevation change there is up the hill toward the green. Our last round brought our group back to The Currituck Club, few miles from the Duck home we used as our base (888-453-9400). Designed by Rees Jones and operated by ClubCorp, the pretty course features holes running along Currituck Sound on the front nine, as well as tee boxes with a view of the Atlantic on the back nine. For players unfamiliar with the layout, prominent 150-yard posts centered in the fairways help with tactical choices on the rolling terrain. The off-season April rental rates for the 8-bedroom house our gang used made Outer Banks golf a decent bargain, comparable to Myrtle Beach or Pinehurst. However, except for nearby Currituck, the other golf courses are admittedly a bit of a hike from Duck. Playing golf during the busy summer would require a significant commitment to travel time each day along the very busy, two-lane Route 12 corridor for the north end of OBX. The folks at Rookery golf are hosting the Titleist mobile golf-ball fitting team at the South Course, Routes 1 and 16, on June 3 from 9:00 a.m. to 4:00 p.m. However, you are asked to call ahead for an appointment. Call The Rookery at 302-684-3000 to schedule your session, or go to titleist.com/golf-ball-fitting for more information.